This study examines the ways in which urban context affects vehicle trip generation rates across three land uses. An intercept travel survey was administered at 78 establishments (high-turnover restaurants, convenience markets, and drinking places) in the Portland, Oregon, region during 2011. This approach was developed to adjust the Institute of Transportation Engineers (ITE) Trip Generation Handbook vehicle trip rates based on built environment characteristics where the establishments were located. A number of policy-relevant built environment measures were used to estimate a set of nine models predicting an adjustment to ITE trip rates. Each model was estimated as a single measure: activity density, number of transit corridors, number of high-frequency bus lines, employment density, lot coverage, length of bicycle facilities, presence of rail transit, retail and service employment index, and intersection density. All of these models perform similarly (Adj. R2 0.76-0.77) in estimating trip rate adjustments. Data from 34 additional sites were collected to verify the adjustments. For convenience markets and drinking places, the adjustment models were an improvement to the ITE’s handbook method, while adjustments for restaurants tended to perform similarly to those from ITE’s estimation. The approach here is useful in guiding plans and policies for a short-term improvement to the ITE’s Trip Generation Handbook. The measures are useful for communities seeking to develop local adjustments to vehicle trip rate estimates, and all could be calculated from spatial data available in most locations. 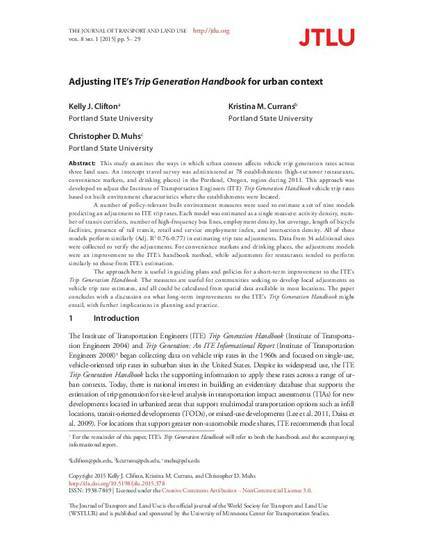 The paper concludes with a discussion on what long-term improvements to the ITE’s Trip Generation Handbook might entail, with further implications in planning and practice. Clifton, Kelly J.; Currans, Kristina M.; Muhs, Christopher D.. (2015). Adjusting ITE’s Trip Generation Handbook for urban context. Journal of Transport and Land Use. Volume 8, No. 1, pp 5-29.